Dementia Friendly East Lothian exists to make life better for people living with dementia. Over 2014, we’ve grown into a diverse collaborative of folk across East Lothian and beyond, all sharing a common cause and passion. A lot has been achieved this year and I wanted to capture the essence of 2014 and say a massive thank you to everyone who has been part of making it happen. It all started with a simple question: What’s it like to live here if you have or care for someone with dementia? What’s it like going shopping, meeting friends, getting a haircut, having a coffee? Where are the good places to go are if you have dementia? Across the board, whether it was going to the farm shop, visiting a stately home, or going to the vet or a gym, it’s clear; it’s people that make places and services dementia friendly. A warm smile, patience and understanding if things go a bit awry or take a bit longer than usual, and respect are what make the difference. In our conversations across East Lothian, themes soon emerged. Just like everyone else, people with dementia want places to go, friends to see and things to do. They want to keep active; have meaningful lives and be connected across generations and across the community. People living with dementia want to keep on doing the things they do every day for as long as possible. They want to be respected and valued members of the community. People want to live with dementia. It’s clear that dementia friendly places and services are here already across our communities, we know what they look like, so how do we make them happen everywhere? Dementia Friendly East Lothian works on the simple fact that people make change happen, very often despite everything. We are all about people. We open and grow conversations which engage people in communities, shops and businesses to talk about dementia. We chap on doors, we talk about our experiences of dementia as we go about our business in the communities we live in. We work with local media, organisations and networks to take the conversation wider and deeper into communities. As the buzz about dementia grows, local people get in touch to find out more or ask what they can do to help. Community events draw folk in to share their views and experiences and find out more; people share pictures and ideas via our Facebook page. Others want to get involved and we talk about what dementia friendly means to them. We go with the flow of the community and allow time for word to spread through local networks. Local champions and leaders emerge and get active, things start to happen. Dementia Friendly East Lothian simply helps to keep the conversations going, make links and do whatever we can to oil the wheels from taking the note at a meeting to doing the washing up after an event. Over the last year, 9 communities have expressed an interest in becoming dementia friendly; 6 are now actively engaged in local conversations, 4 have had community events. We’ve got over 400 followers on Facebook and an e mail list of over 200 organisations. Local papers have featured Dementia Friendly activities regularly though the year and we’ve been covered by local radio stations. 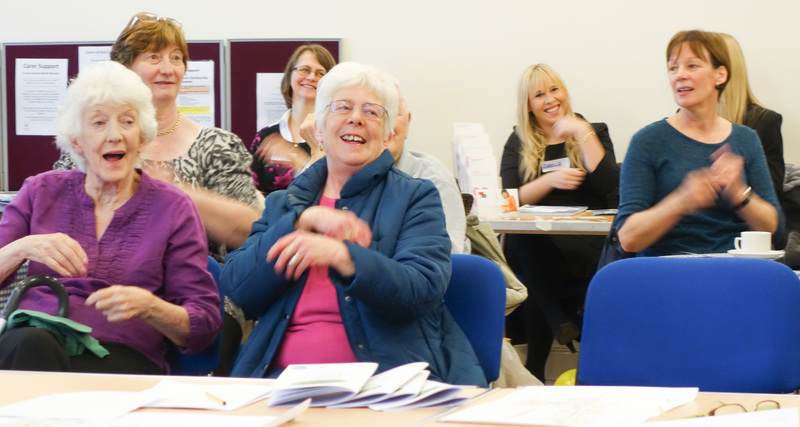 In November we held our first collaborative learning event where people from across East Lothian came together to talk about what they’ve been doing and what we can do next. People with dementia told us that they lost contact with friends when they went into residential care. 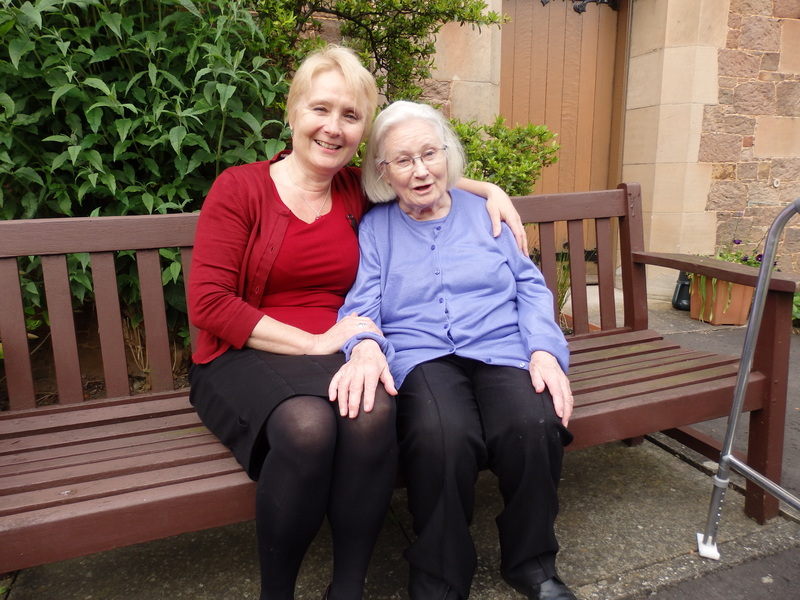 Now care homes in North Berwick take residents round to each other for tea so friends can stay in touch. People with dementia wanted things to do and places to go. North Berwick and Haddington libraries set up drop in cafes and Sporting Memories groups and have done dementia training to make their services accessible to everyone locally. People with dementia wanted fun and laughter with their friends and family: Luminate gave us money for 2 community events in Haddington and North Berwick Day Centre for over 100 older people, many with dementia, and their friends. There’s lots of great things in the pipeline from community cafes to sponsored walks to swimming sessions and local people and organisations are raising funds to support dementia friendly work in their own community. People are accessing training on dementia and using the new Dementia Friends scheme. And that’s on top of the great work that’s already going on in Day Centres, Care Homes, schools, libraries and churches up and down the county. So what about 2015? There’s work to be done to strengthen the voices of people living with dementia so they have a greater influence and say on the things that matter to them. 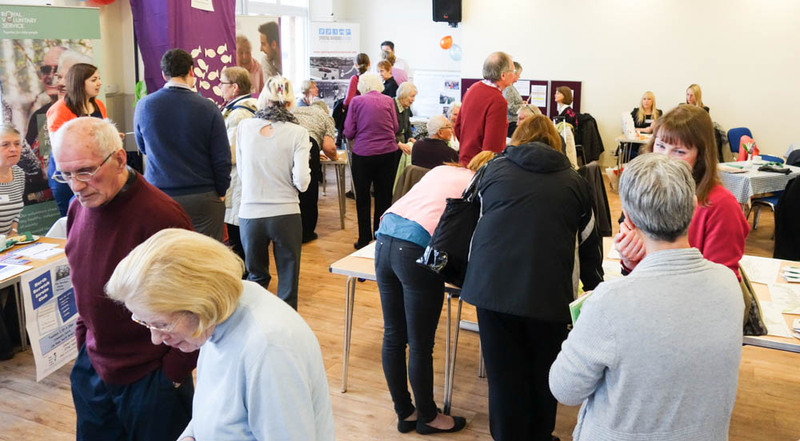 Some communities across the UK have local forums where people with dementia come together with decision makers and service providers to improve things. That might be an option for East Lothian too. Our Dementia Friendly Communities are growing apace and Dementia Friendly East Lothian is there to support them and new communities be the type of Dementia Friendly Community they want to be. We help communities share experiences and learn from what’s being done in East Lothian and beyond. The best thing about 2014 has been seeing the wellspring of generosity of spirit of people across East Lothian to make a difference; to make life better for their friends, neighbours and communities in whatever way the can. People have given their caring, their time, energy, creativity and money to make things happen. New relationships and understandings have been built. And we have done this ourselves. This is not a top down initiative, it comes from the heart of our communities, we are making this happen because we care. A massive and heartfelt thank you to everyone who has done something to help make East Lothian a bit more dementia friendly this year. Whether you’re picked up a leaflet, baked a pancake or tiffin, spent time with someone with dementia, done some dementia training, smiled a bit more or become a dementia friend, thank you for helping to making our world a better place. Wishing you all a very happy and healthy 2015. May it bring you everything you’d wish for yourselves. And of course a year in which East Lothian will become even more Dementia Friendly! I’ve never met someone who lives with dementia who hasn’t got a horror story or two about teeth or toenails. These small, but potentially troublesome bits of body can be a veritable nightmare when you’re caring for someone with dementia and they are usually the bits that the health and care systems don’t want to touch with a bargepole. If anything exemplifies the need for health and social care integration and a focus on prevention it has to be teeth and toenails. If you’re eating your breakfast, look away now. No I won’t use photos but the mental images are just as bad. Teeth. The very thought of teeth and dementia makes my jaws clench. A lifetime of 6 monthly dental visits, hygienists and daily brushing and flossing counted for nought when dementia set in. Mum not only forgot to brush her teeth, but the 15 minute care slots in the morning and bedtime were just not long enough to even begin to tackle teeth, how could they be? Over a period of 3 or 4 years, those chocolate biscuits and the excessive amount of cake older people are fed all the time took their toll (see a future rant about cake and older years!). By the time Mum got into the care home and a daily dental regime was put in place, the damage was well and truly done. Mum has had more fillings in these last few years than her whole life and then teeth started to fall out. She would be heart broken if she knew, she always brought us up to take care of our teeth. If we ever got to the stage of her needing all her teeth out (God forbid) false teeth are likely to be a problem – what if Mum can’t remember that she’s got false teeth and takes them out or gets a fright with them in? It’s not vanity. An infection is a nightmare. It may get missed because people assume it’s just the dementia; if you’re living independently at home with dementia taking antibiotics correctly is unworkable (even with carer visits). You have to watch carefully for signs of pain whilst your loved one is eating – not conducive to a relaxing meal. All too easily a minor bit of tooth decay becomes something serious with a hospital visit looming at the end of it. Our local dentists are great and know well how to support Mum, they really do epitomise person centred care. They explain what’s going to happen and explain what they’re doing as they do it. They are calm and very very patient. But what if something hurts and Mum asks them to stop mid treatment and won’t let them continue? As I’ve got power of attorney I’d have to decide about restraint, of my Mum. It doesn’t feel right. Luckily Mum knows exactly what to do when she gets in the dentist’s chair and she’s very good at doing what she’s told – it’s become one of our family jokes. What’s it going to be like for my and future generations when dentists are dealing with complicated things like implants, root canals and bridges. A lot of carers I speak to have found their own dental health suffers along with everything else, creating a whole new generation of problems now and for our older years. I too have had more tooth problems as a carer than all through the rest of my life. Toenails are another bugbear. They’re not physically or psychologically like finger nails. They’re often quite hard to cut, hard to reach and are tucked away from sight in socks and shoes. Folk are often embarrassed about their feet and a bit wary of who gets close to them (sometimes with good reason!). Toenails are fiddly and feet can be sore or tickle, toenail cutting becomes a skilled job. Unnoticed toenails can grow and start causing all sorts of problems from falls to cellulitis – both of which happened to Mum more than once. Yet again, A&E looms with all it brings with it. Luckily Mum and I have survived another dental nightmare, thank goodness. Fingers crossed that’s it for now. Magic happens when people get together to change the world, so that’s what we did to create our vision for a Dementia Friendly North Berwick. After 6 months of talking to people, chapping on doors and walking the streets of North Berwick we finally held our Dementia Friendly Community event on Tuesday. We reckon about 100 folk came through the doors of the Hope Rooms to help us transform our town. What a range of people! Local shopkeepers, volunteers, people with dementia and their families and friends; care providers, policy makers and service providers all came together to talk, share their ideas and maybe sample a scone or two (baked by our fabulous North Berwick Youth Cafe – thank you guys!). In the centre of the room we had large maps of North Berwick, Dirleton, Gullane and Aberlady and Laura and Andy helped folk to tell us where were the great places to go and what made them good. We have a wealth of great places to go! Our very own North Berwick Day Centre and care homes, cafes, pubs and garden centres, museums and golf clubs and of course the beach. Even the RNLI got a mention for being friendly and taking time to explain about their work. What made a place great was the people – friendly, supportive, kind and respectful people make good places and good services great – simples. This really is all about people. 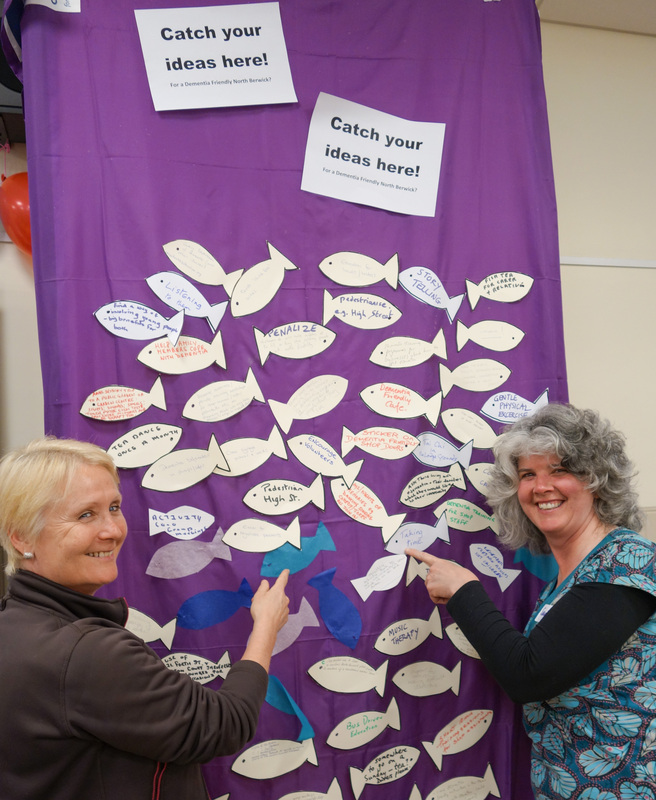 Sandra from the Community Centre set up a massive net for us to catch everyone’s ideas for making things better. What a catch! A real high spot was when Helen from Fidra Nursing Home and 3 of her residents led us all in a hand jive dance to the Proclaimers 500 Miles. You can see from the faces that it was great fun and something we could all do together. So what next? Sandra is writing up the day so we can share all the great ideas more widely with our community. We’ll be looking for offers of help to make things happen. Who can provide some training? How can we help local shops and services? How can we support local carers more? We’ve got some really good ideas for small things that will make a big difference, and that of course is what it’s all about. We’ll also be talking to other communities who are interested in becoming Dementia Friendly too. We did all this with a small grant (£500) from the Community Centre and a lot of goodwill and active support from volunteers and paid staff from a whole range of bodies and organisations. Yet again it shows that changing the world is not really about money, it’s about people. Our hope and belief is that by making our community a better more supportive place for people with Dementia we will not just improve their quality of life, we will also help people stay safely and happily in their own homes for as long as they want to. Research shows the importance of social connections to our health and well being and we know that living with dementia can be a very scary, lonely and risky existence. I know that for my Mum, when she feels understood, respected and supported she is calmer, happier and healthier, who doesn’t? As Mum would say, it’s all about living and not existing. Massive thanks to everyone who made it such a great day. It really was a day to remember and the start of the next stage of our journey. For the last few months a group of us have been working to set up Dementia Friendly Towns in East Lothian – starting with North Berwick. Dementia Friendly places are springing up in quite a few locations. Up north, there’s Dementia Friendly Highlands. In Swansea and Brecon in Wales, Dementia Supportive Communities are being set up. Motherwell, Stirling, Edinburgh, York and many more towns and communities are embracing the idea of being Dementia Friendly. Just as each and every place is different, so the approaches vary. In Dementia Friendly Highlands and Swansea for example, local people with personal experience of services have been the driving force behind the initiatives, they know just exactly how good or bad local their services are from direct experience and they know what is needed to make them better. They’ve created local forums where GPs, councillors and local people get together to make improvements. The focus is on better services but through a whole community approach. The priority is that a diagnosis of dementia doesn’t mean a life cut off from everything around you, and people are helped to continue to do the things that give their lives value and meaning for as long as they wish to. Other Dementia Friendly initiatives are led by Local Authorities, NHS or third sector bodies like Alzheimer’s Scotland, The Dementia Services Development Centre at Stirling, or the Joseph Rowntree Foundation and have involved training local shops and businesses and advertising campaigns to raise awareness and challenge stigma. Dementia Friendly communities, towns and cities have done a lot to raise local awareness and thinking about what life is like for people with Dementia, their unpaid carers and families. In North Berwick, we’re taking a very local, community-led approach. We think that improving the quality of life for people with dementia is very much dependent on the quality of everyday life in the community. Shopkeepers, business people, churches, coffee shops, sports clubs, all the places we go everyday can do a lot to make life for people with dementia and their carers easier. This will help people keep in touch with their friends, doing the things they like doing after a diagnosis. And of course, the fast pace of life and rushing about is hard for many people, not just people with dementia, many of us would benefit from giving and getting a bit of patience and kindness! The the initiative is being led by the North Berwick Day Centre (I’m on the Committee and my Mum had many many happy times there) and the North Berwick Community Council, with great support from East Lothian Council, Alzheimer’s Scotland, Age Scotland, Sporting Memories Network and others. We started small, simply walking round the town asking local people about whether they think we need to do more to support people with dementia in our community. Along with the help of our local Community Learning and Development Officer Sandra, I’ve been chapping on doors up and down North Berwick High Street and beyond telling people about our hopes and aspirations and asking for their support. It’s been a touching and humbling experience. I started off talking to the people that helped me and Mum through our journey – GPs, Dementia Nurses, Pharmacists, housing providers and of course the Day Centres and Care Homes. I just nipped into shops and businesses when I was out and about. The shoe shop where daughters often take their parents with dementia to buy shoes; the post office and the postal delivery office (there were days before we got Mum and Dad to live near us when the only person they say for days on end was the postie); the library, the bakers and the coffee shops where people pop in during the day. Dentists, opticians and the physios also said that they often wondered if patients and clients had dementia and what could they do to help, they often had long standing relationships with people over many years and knew them well. I found knitting circles in the pub and tea dances in the Hope Rooms; local school pupils designed us flyers and logos and walkers and gardeners all want to do their bit. So many people I’ve spoke to have been personally touched by dementia in some way and wanted to help in whatever way they can. information on dementia so people know how best to support each other. Every single one of us wants these simple basic pleasures out of our lives, I know I will want to keep in touch with friends and keep active in whatever way I can, why do we think that a diagnosis of dementia or just getting older stops all that? It doesn’t and it’s what makes life worth living whether you’ve dementia or not. We know from our colleagues in the Highlands and Wales that communities can come together and make a real difference, but it has to be in a way that is meaningful and manageable for local people. So to find out what people in North Berwick want, we’ve organised 2 community events on April 22 in the Hope Rooms in North Berwick. 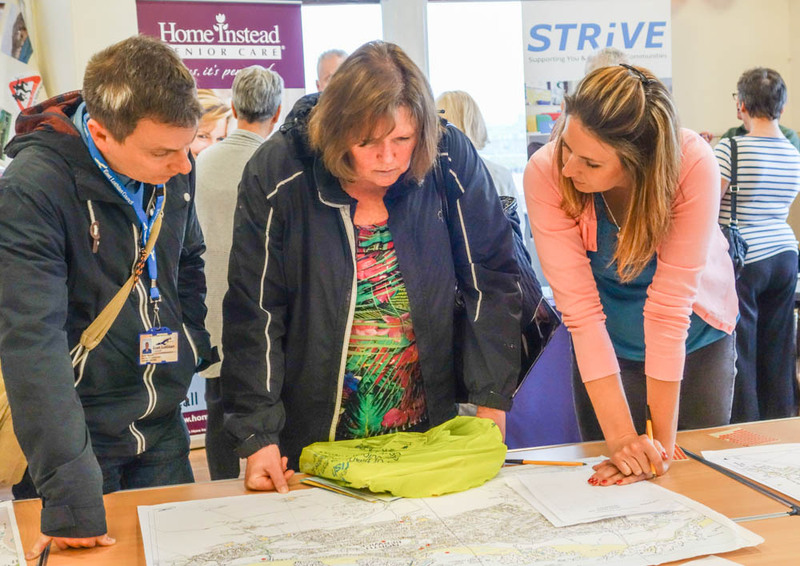 They’ll be ‘drop in’ sessions where people can come and get information and have a chat and share their hopes and aspirations for a Dementia Friendly North Berwick. We hope it will be fun too! At the end of that day and using all the information we’ve got from talking with people, we should have a good sense of what a Dementia Friendly North Berwick would look like and how to make it happen. Over the next week we’ll be planning the drop in sessions, arranging publicity and deciding how to make use of the many generous offers of help and support we’ve had. Then all we have to do is to weave these good wishes and warm hearts into a beautiful tapestry of community connections and caring and help other communities have their conversations too – Simples! Luckily we have the support and experience of our fellow travellers in Highlands and Wales to guide us. The Dementia Friendly movement shows clearly how local communities can make things happen and be part of a larger movement so that good things happen everywhere. This isn’t scaling up or rolling out, but learning , sharing and growing. And of course, it’s not just about dementia, it’s about all of us being connected to our communities, whatever life and the ageing process send our way. For many years I believed that research and evidence would change the world. I spent years doing research on how new and innovative approaches deliver better services and achieve better outcomes. I spent hours in round tables with all kinds of people talking about how we can support ‘joined up working’ and break down silos. I did and transcribed hundreds of interviews and group observations. I read libraries full of books read, summarised and disseminated them. Then I saw the light. I was working for the Commission on the Future Delivery of Public Services (the Christie Commission) when the penny dropped. Christie showed us that great public services, person centred, effective and empowering, were already with us. Research had been telling us for years the factors that make a difference. The problem was that we weren’t paying attention. We wanted more robust research, bigger numbers and more proof, even though the messages had been dripping through in small studies and from voluntary and community groups for many years. Why were we resisting the emerging truths? Why were we so keen to hold onto what we knew wasn’t working? The Christie Commission reminded us all that public services are about people, and that often our best public services happen because people make them happen – despite the system. It’s not the system that delivers the services, but people with passion and commitment and determination. I started to take things personally and began to reflect on my experience of services; I’d been carefully keeping the two separated (or trying to!). I got plenty of food for thought. For the last decade I’ve been living a double life – by day a public servant and for the other 24 hours of the day, a carer for parents with dementia who wanted to live independently as long as possible. I moved gradually and almost imperceptibly from an occasional user of public services to a carer with 24 hour responsibility for loved ones increasingly dependent on a range of public services to get by. The quality and availability of these services controlled my days and kept me awake at night. I was up close and personal with the reality of public service delivery from the sharp end. It was quite an experience. What shocked me most was the complexity. Despite having worked in and around public services most of my life, I struggled to understand what was going on. The sheer volume of different people and services we had to interact with was scary. Mum and Dad were defined as ‘complex cases’ which meant we had input from myriad professional groups and services. GP and dental appointments, podiatrists and opticians gradually escalated to include hospital visits, tests, assessments, treatments, reviews. We had referrals from across the Health Service and social work. Gradually I had to deal also with banks, energy providers, the DWP, you name it.Every person needed authorised to speak with me, everyone was fixing a different bit, almost no one had a focus on the whole person. Different faces, different buildings, bus trips here there and everywhere. Being old and having dementia is a full time job! I was increasingly enmeshed in a very complex system. When my parents had falls, the whole system ratcheted up and we added a whole new layer of concerned professionals. I struggled really hard, what must it be like if you’ve got dementia and are managing alone? How on earth do you find your way to new hospital annexes and departments in places you’ve never heard of? Even if there are bodies out there to help you, how do you know that? How can you change a lifetime of being independent and taking care of your own life? I dread to think how my parents would have coped without family support. In all that complexity, confusion, fear and uncertainty the kindness of strangers shone out. The people who took time to show they care, who understood our confusion and fear, who saw us as people – they helped us more than you can possibly imagine. Being treated with kindness and humanity made an incredible difference to my parents and me. The world can be a very scary place if you’ve got dementia. A kind word, a gentle hand reassured and calmed my parents, helping them understand and cope with what was happening. It helped me too as I struggled to take on this new and scary role of carer. I’ll never forget the kindnesses. Ray, the volunteer from Age Concern (now Age UK) who helped Mum understand why power of attorney was an essential safeguard to protect all our interests. Ray spent months explaining, reassuring and helping Mum make a very hard decision. Without that power of attorney life for us all would have been impossible. Mum having an independent advocate on her side was a very powerful experience for us all. Sue the health visitor who worked with me and Mum when Mum was opening the door and letting people in. Warning her of the dangers of opening the door made Mum very anxious and confused. Sue designed a cheery smiley sign for the back door reminding Mum to check who was there in a way that made her feel confident not scared. Feeling relaxed made Mum confident, happy and better able to understand her surroundings. Carol from the Day Centre who helped me find my way through services and red tape and who gave Mum many happy times and awoke a love of singing which has been a great gift along Mum’s journey. I could go on and on, Fiona, Liz, Diane, Scott. Just a very few of the many people who have helped Mum live not exist. They treated us as people, with kindness and respect; they treated us like fellow human beings. The worst times, which I won’t dwell on, were when Mum was invisible. There were times when people walked past Mum as she screamed in pain or sat bewildered all day in her nightie in a side ward waiting to be discharged. I really don’t blame the staff, I’m sure they are all committed, hard working, dedicated and under-valued. But what kind of system makes people like Mum and me invisible? What kind of system dehumanises us all? So when my full time caring responsibilities abated and life shifted on its axis, I realised that if I’m serious about changing the world, I had to get out there and make things happen. Public services won’t just change on their own, everyone has to take personal responsibility for their actions and I’d done enough research and enough talking. I need to be part of my community, alongside the people ‘out there’ who are making change happen. I need to find out how far I can get in changing the world, as a citizen who wants to make things better. So, I’m setting out to make our local communities more dementia friendly. We’ve made a start and this blog will help me chart and reflect on my journey. I know there’s lots of inspirational people out there to help me on my way.